Mike is absolutely right, that's why I gathered mandatory servicing schemas from the different places and designed some more. Schemas for a single route direction are represented first. "Schema 10.1 shows the layout for a standard mandatory servicing depot. The most important feature are the track tiles running past the depot, continuing straight on in the case shown. Without them, trains are prone not to find their destination, because the track leading into the depot and out of the depot doesn't count as continuous. However, a reverse signal must be placed on the track running past the depot, since without it, the train wouldn't care about the depot, but run on without getting serviced. (A train from A turns on the signal C and through signal E goes in the depot D and than through signal F goes to B) With this layout, the distance trains have to travel is about 40% longer when compared to the straight section of track. Plus the length of the train! The train is not considered to be inside the depot until its last wagon has disappeared. So, mandatory servicing is beneficial for the reliability of your trains, but don't go to extremes by constructing mandatory servicing depots only a few tiles apart! Sometimes, there isn't enough space left next to the dual track. So you might want to construct a depot parallel to the track (see schema 10.2). The distance travelled by trains outside the depot now is 60% larger, though. So why not shorten the particular section of track the train really uses? The necessary bypass section then has diagonal elements, and the additional distance trains have to travel is really small. Take a look at schema 10.3 which shows the optimum layout for mandatory servicing." And now, let's have a look at the combined depots. A dual depot schema (schema 10.4) is designed by Chris Doherty. That is what he says about it (my comments are placed in brackets): "A very useful application of this arrangement is in implementing a "dual depot" (or more if you want) that gets trains in and out alot quicker than one depot on it's own. Observe: You can see that a train reaching the fork (A) will see the "two-way" signals (E and E') in front of it and choose the track that is free. 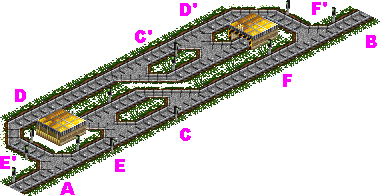 This allows a train to enter one depot while another train is either leaving the other depot, or still going into it (e.g. to choose D' if D is in use). This setup is very useful for high traffic lines." But what can be done if the line works in both the directions? The simple and reliable solution is just to put the standard schemas, used in the traffic route with specified direction (schema 10.5), without direction signals A and B.